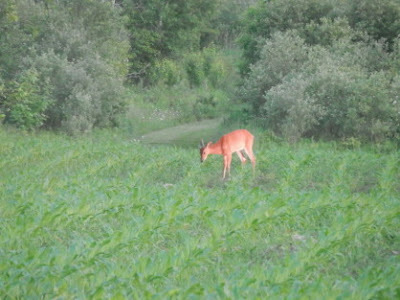 I looked out the window yesterday and the sun was hitting this deer--it almost looks like it is glowing! You can also see how much the corn is growing. 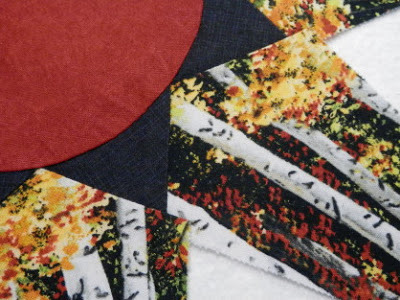 Many of the long-term quilting classes are coming to an end. It's a bittersweet time for all. When we start, nine or ten months seems like a long time. And then it's over. But for most, after a month or two off, we start again on a new project. 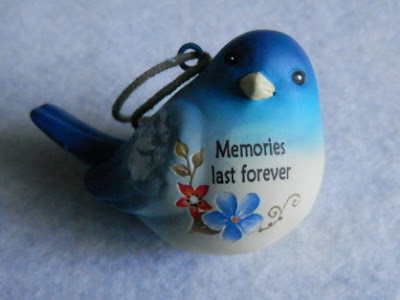 When Monthly Bliss 3 ended earlier this month, Joanne gave me this beautiful ceramic bird. She is one of the nicest women you would ever want to meet. (I was very fortunate--all the women in this class were just delightful!) (As are all my students!) Thank you, Joanne, for the lovely memories we made in class and for this lasting reminder. Last Saturday I traveled to Morrisville to do a trunk show for the Americana Village Quilters. We had a fabulous time, and afterwards, Beverly, Holly and Diana took me to lunch at The Purple Salamander. Great food, great company and purple salamanders decorating the walls. What's not to like. Thanks, Holly and Diana, for the treat! For those who have been asking about a class on using the Featherweight attachments, don't hold your breath waiting for me to run one! I am perfectly happy to go forward and back. But...there is a great book that shows exactly how to use all those attachments--with color photos and illustrations. The Sewing Machine Attachment Handbook by Charlene Phillips has up-close and personal directions that make it easy to use those attachments. And, at $16.99, it's a great buy. It also has explanations for some of the attachments for the newer machines. There, I think that catches us up. I've been busy quilting and sewing and trying, in vain, to clean off the horizontal surfaces again. Stay cool--it's going to be a scorching week. P.S. I just finished listening to Zero Hour by Clive Cussler, and am listening to Sleight of Hand by Phillip Margolin. Still reading horse books. P.P.S. My printer died just as I put in a new black ink cartridge. If anyone can use an HP 74XL ink cartridge, let me know. As usual, the new printer takes totally different cartridges. Gotta love technology. NOT! 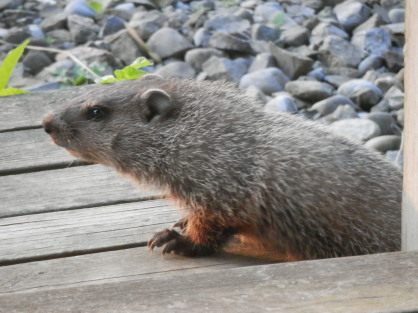 Some of this year's litter like the front porch. 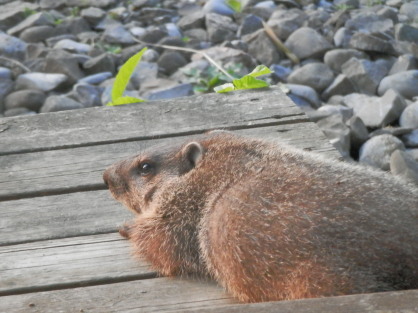 But three newbies like the back porch. With the inside door open, Dickens has an eye-to-eye view. Mama Woodchuck is on the right. 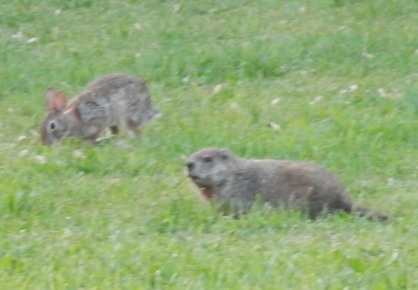 And the rabbit doesn't seem to mind sharing the grass. 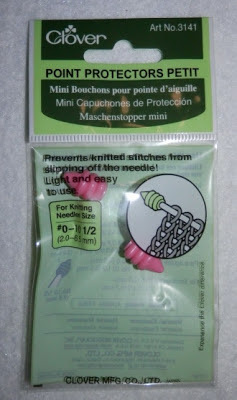 Also, thanks to Jay--he was the first one I saw with the knitting point protectors on his scissors. I hadn't remembered that until I saw him on Tuesday night. Scissors. Small, sharp, pointy. Great for snipping threads, clipping for applique and lots more. But those points can also wreak havoc in your sewing box or bag. I remember an extremely sharp pair I had put in my jumper pocket, with a wonderful beaded fob attached. Well, the fob overweighted the handles and, as I put my hand in the pocket to retrieve them, managed to stab myself big time. Right before the start of a 6 hour class. So I speak from experience on this one! Enter a knitting notion to the rescue! For the small scissors I like, these small point protectors are the bomb! Four to a package for around $5. 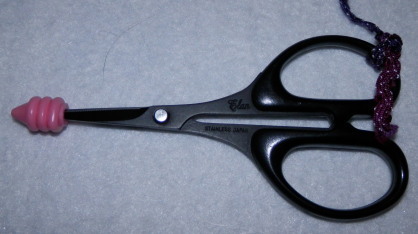 Here's one on my favorite scissors: Elan 4" with serrated blades. Great for holding the fabric in place as you are trying to trim and clip. You could always make a little "anchor chain" to keep the point protector attached to your handles...but I just throw my protector into the box until I'm done for the day. And these are pink--what's not to like? And here's a sneak peak at what I'm working on. Hand pieced. I'm really happy with it and am getting ready to design the borders. P.S. I am listening to Night Moves by Randy Wayne White. I am reading several books at the same time, most of no interest to any of the reading audience--a Reiki book, three horse books, two quilt books.